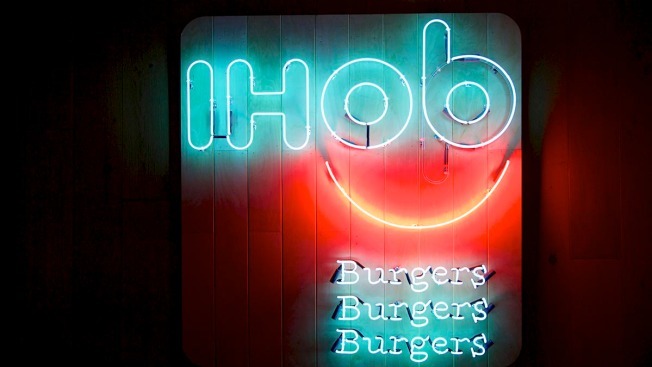 Red Robin joked it’s “as serious about pancakes as @IHOb is about burgers"
This undated photo shows the neon sign outside of a new International House of Burgers restaurant in Hollywood, Calif.
Several national burger joints responded to the name change on Twitter. Three industry experts questioned the temporary name change. The International House of Pancakes, commonly referred to as IHOP, created a social media frenzy last week, when it announced intentions to change its name to “IHOb.” But customers had to wait until Monday to find out what the “b” represented. In a news release, the company said the “b” stands for “burgers,” and the name change is part of a rebranding campaign to promote the restaurant’s new line of Ultimate Steakburgers. The restaurant changed its Twitter handle to “@IHOb” and opened an IHOb restaurant in Hollywood, California. It also debuted a new commercial. However, while the new hamburgers will remain on the menu, the “IHOb” campaign will end later this summer, a restaurant spokeswoman said in an email to NBC. Wendy’s said it’s “not really afraid of the burgers from a place that decided pancakes were too hard,” and Moon Pie revealed its intention to keep its name. Burger King changed its Twitter name to Pancake King. Still, the company is excited about the newest menu additions. “Everyone knows that IHOP makes world-famous pancakes so we felt like the best way to convince them that we are as serious about our new line of Ultimate Steakburgers as we are about our pancakes, was to change our name to IHOb,” said Brad Haley, chief marketing officer for IHOb restaurants, in a news release.